Cottontail rabbits are such a common sight in southern Michigan’s city parks, gardens and backyards that you may never think about where else they live or about the habitat they need beyond our neighborhoods. But rabbits also live on public lands and state game areas, where, with a little help from humans, they benefit from improvements to the existing habitat. The brush piles that are built for them provide protection from predators and cold weather and occasionally serve as nesting sites. 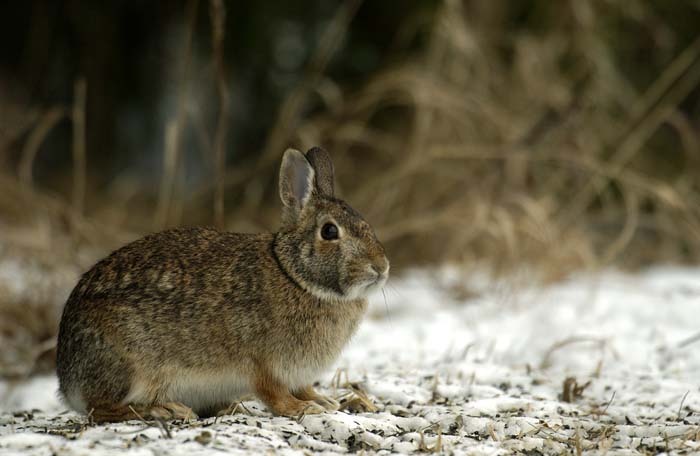 Although the Michigan Department of Natural Resources actively manages habitat on public lands for other species, such as deer, birds and waterfowl, the habitat for rabbits – often called “rabbitat” – is most often improved as a result of other projects. For instance, if invasive woody plants are cleared from grassland to improve pheasant habitat, or if trails are cleared to improve access in-state game areas, the brush piles needed for rabbitat can be built along the edges using the material that’s been removed. “Rabbits are often managed while managing for other species. Brush pile construction links into almost any sort of habitat management,” said Adam Bump, small game specialist for the DNR. Much of the rabbitat work is done with the help of volunteers provided by Michigan United Conservation Clubs through its On the Ground program. The program, which began in 2013, is supported by a Wildlife Habitat Grant from the DNR. The money for the grant, and for all other wildlife conservation efforts in Michigan, comes from the license fees paid by every hunter and angler in the state. “It is a common misperception that wildlife conservation is funded by state taxes, but that is not the case. Hunters and anglers not only volunteer their time but also provide the money needed for conservation, through their purchases of hunting and fishing licenses,” said Matt Pedigo, chair of the Michigan Wildlife Council. Created in 2013, the council is entrusted with increasing public knowledge of the importance of wildlife management and conservation, as well as the positive impact that hunting and fishing have on Michigan’s wildlife and natural resources. Hunter Salisbury, MUCC’s outreach specialist and On the Ground coordinator, contacts DNR wildlife biologists around the state to find out if there are habitat projects that they would like to do but might need help to complete. Those projects are then announced on the MUCC website and Facebook page, so people can volunteer to help. In many cases, the volunteers are small game hunters themselves. Trotter adds that sometimes the volunteers are not hunters themselves. They may simply enjoy walking the trails or seeing birds and other wildlife. Several popular state game areas in the southern part of the state benefited from rabbit habitat projects performed by the DNR and On the Ground volunteers during 2018. On Feb. 24, 2018, volunteers completed habitat work at the Gratiot-Saginaw State Game Area. This was the third time that volunteers and students from the Midland-Dow High Conservation Club had worked to restore a wildlife opening by cutting timber and shrubs and building brush piles for rabbitat. That area is now clear and can be further prepared for more plantings that will benefit other wildlife. Just a few weeks later, a group of 12 volunteers worked on a project at the Dansville State Game Area. “At Dansville, we cut down trees and built brush piles in order to connect trails to help improve hunter access on the state game area,” said Rose Lake Wildlife Technician Chad Krumnauer. The completed project connects a forest road from the Hewes Lake DNR access lot to the lot at Seven Gables Road. Several rabbitat projects are planned for early 2019. 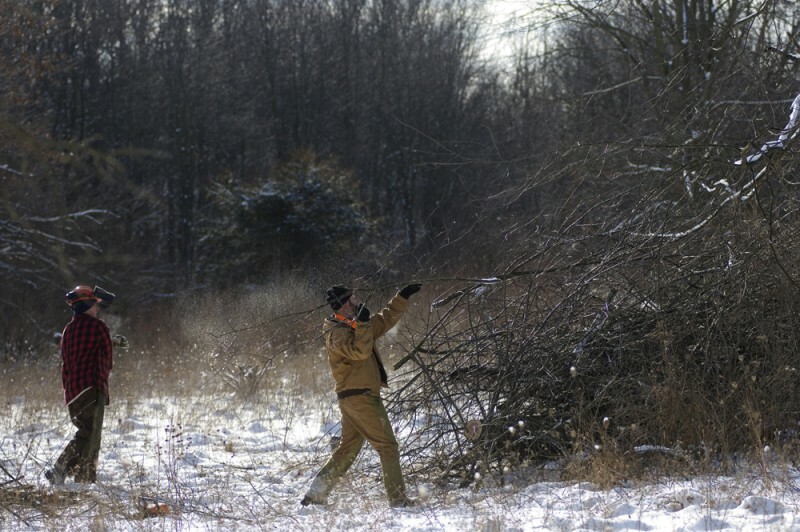 On Jan. 19, volunteers will thin boxelder trees and construct rabbit habitat at the St. Clair Township State Game Area. Following that will be another project at the Gratiot-Saginaw State Game Area, scheduled for March 9. Details about both projects will be posted on the MUCC On the Ground webpage as they become available. Like other conservation projects in the state, the work that’s done benefits just about anyone who enjoys the outdoors. “If you’re a bird-watcher or just like nature in general, the brush piles are a cool thing to have because they’re valuable for other species,” Bump explained. Songbirds, including flycatchers, often use the brush piles as a place to perch. Reptiles, snakes, turtles and other small mammals also make use of them.